Родилась 27 июля 1984 г. в Краснодаре. Воспитываю сына, работаю преподавателем английского языка и математики. Хобби — занимаюсь разведением кошек породы русская голубая. 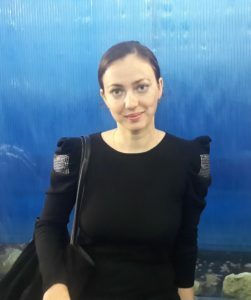 Публиковалась в периодических изданиях и Интернет-ресурсах. Принимаю участие в разных литературных конкурсах. I was born on July 27, 1984 in Krasnodar. I bring up my son and work as a teacher of English and mathematics. My Hobby is breeding cats of Russian blue breed. My stories were published in periodicals and Internet resources. I take part in different literary contests. At twenty-two grandmother went to work in Krasnodar and met my grandpa. They got married and gave birth to mother and uncle. My grandmother worked as an embroideress at a factory all her life then retired and began to educate me. She always knitted something, walked silently, loved crossword puzzles and watched all possible soup operas. I loved her knitted things so much: I keep still a pink hat knitted by her. I have so little left of her— just a few crochet handkerchiefs. And we had one foot size and sometimes I put on her shoes. — How did you do today? What did the teacher say? Granny held my hand, listened and nodded silently probably not understanding anything about the dominant seventh chord, tremolo or Passive voice. I wrap up in the memory as in a warm shawl … I close my eyes and feel her smell, a home smell of a warm body and valerian. As if I feel the touch of her handmade blouse.